It’s Day 225 of “365 Things to do in Cincinnati” and today we went to the Crafty Supermarket. 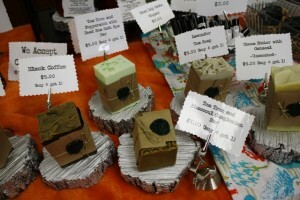 Craft show season is gearing up and this show was the perfect way to get it started. 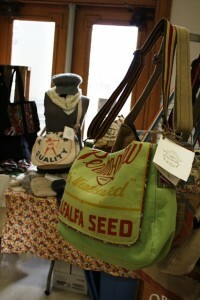 The Crafty Supermarket is free and open to the public. 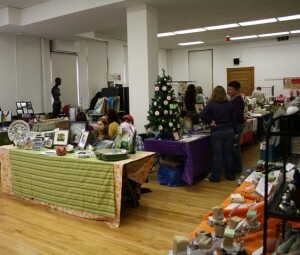 Held on Saturday, November 20 from 11am-6pm at the Clifton Cultural Arts Center, the Crafty Supermarket has over 50 craft vendors. The organizers allowed me in early to snap some pics before the crowd entered so don’t think there’s no one there because my pics show empty booths. They had over 1500 people attend their last show! 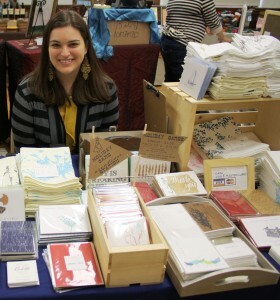 Here’s a 365Cincinnati reader, Keli from Colette Paperie. 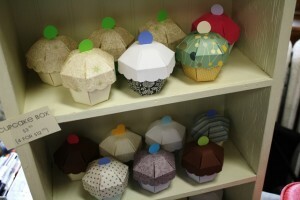 She has some AMAZING paper crafts (cards, notepads, etc.) 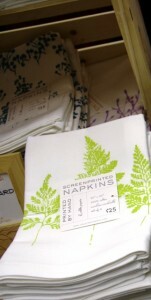 as well as some incredibly gorgeous hand stamped dinner napkins (shown below) that would be perfect for the Holidays. This is the third Crafty Supermarket. 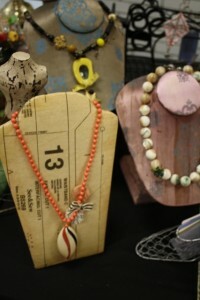 This is an “indie craft show”. Not sure what indie is? Click here for Craft Supermarket’s brief explanation. My basic thought about “indie” is that it’s similar to the kind of stuff you’ll find at Etsy.com (and I’ll bet lots of these crafters sell there too!). You won’t find anything but crafts at this show. Well, that and some great food. Providing food for your enjoyment are more local businesses: Cafe de Wheels, Dojo Gelato, Picnic and Pantry, Sweet Peace Bakery, and La Terza Coffee. And don’t forget that when you shop at the Crafty Supermarket you’re helping to support great LOCAL business owners. And remember to take cash. 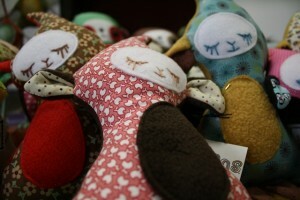 A few crafters take credit cards but most accept cash only. It was an awesome show, what an amazing turnout! Thanks Bridgett for this great post publicizing the event! I only got this email today. I just popped up. I would have been nice to see this earlier. Now I missed this event. Very sad. Melody – Sorry you missed it. They do have a show in the spring too so watch their site (link above). And you might also want to keep an eye on our site because I’m trying to post things that happen over the weekend in the upper sidebar (so you can see them before they happen). It was a madhouse. I’m glad people respond so well to it and attend, but I couldn’t see a thing. I could barely move through the crowd and browsing was utterly impossible. I was excited to go, and I would have spent money there if only I could have seen some merchandise. I saw many empty-handed people leaving as I entered, and I have to think they also didn’t have the opportunity to look at all the terrific vendors. Doesn’t the venue have a whole other floor they could spread out to? I was actually there and I still feel like I missed the event.